I went to see The Last Jedi last night, and I have to say, I was really blown away. Considering, at its core, it’s a very straightforward movie, there was a hell of a lot going on! This blog post will contain spoilers, so please turn back unless you’re willing to take the risk – but suffice it to say, I really liked it! The movie picks up almost immediately where The Force Awakens left off, with Rey meeting Luke on Ahch-To and returning his lightsaber. Luke is initially very reluctant to teach Rey anything, but eventually offers her three lessons. During their time together, Rey learns that Luke almost killed Ben Solo during their training, as he had seen the corruption Snoke had managed to inveigle into his student, but stopped himself. However, Ben turned on Luke alongside a handful of students at the Jedi temple, killing the others and leaving to join the First Order. The Resistance is on the defensive against the First Order fleet, being hounded across the galaxy due to the First Order’s ability to track their ships through lightspeed. Realising this, Finn and a mechanic named Rose decide to infiltrate the First Order star destroyer tracking them, and disable the device in order to allow the Resistance the chance to flee. In order to do so, they travel to the casino city of Canto Bight on Cantonica, but are apprehended by the police and imprisoned. There, they meet the slicer DJ who offers to help them, and after a hectic breakout, manage to flee the world. DJ gets Finn and Rose to the First Order flagship, but betrays them and they are once again captured. During a First Order attack on the Resistance, however, General Leia was seriously wounded, leaving command of the fleet with Vice Admiral Amilyn Holdo. She and Poe clash over the vice admiral’s apparent lack of determination, and when Poe discovers she is seemingly intent on abandoning ship, he leads a mutiny against her, as he is desperate for Finn and Rose to get through and disable the tracking device. However, Leia stuns him and the extent of Holdo’s plan becomes clear: she intends to allow cloaked transports to flee the Resistance flagship, providing a decoy for the First Order to continue to follow. Rey, communicating through the Force with Kylo Ren, decides to leave Luke and return to known space, intent on turning Ren from the dark side. She allows herself to be captured by the First Order, and Ren takes her to Snoke, who chides her foolishness for thinking she can turn him. As Snoke laughs in triumph, seeing Ren using a lightsaber to destroy “his true enemy”, Ren uses the Force to bisect Snoke with Luke’s lightsaber. The two kill Snoke’s guards, then Ren offers Rey the chance to join him in ruling the galaxy. A Force struggle ensues, and Rey leaves to rejoin the resistance. The main Resistance forces are making their way to the old Rebellion outpost of Crait, but are discovered by the First Order and largely destroyed. However, Holdo sets a course directly for the First Order flagship and jumps to lightspeed, destroying her own ship and tearing a chunk out of that of the First Order in the process. In the confusion, Finn and Captain Phasma duel, with Finn managing to best his former boss before he and Rose escape the ship. The Resistance reconvenes on the salt mining world of Crait, but so few remain and soon the First Order arrives in force. After an initial bombardment, Luke seems to appear within the base, and heads out to confront the enemy. Ren, now Supreme Leader of the First Order, orders every gun to blast him to pieces, but he emerges unscathed, at which point he goes out to duel his uncle. However, it soon appears to be nothing more than a Force projection, Luke allowing the remaining Resistance leaders time to flee from the mine with Rey and Chewie aboard the Falcon. Exhausted by the effort of projecting his consciousness across the galaxy, Luke dies. 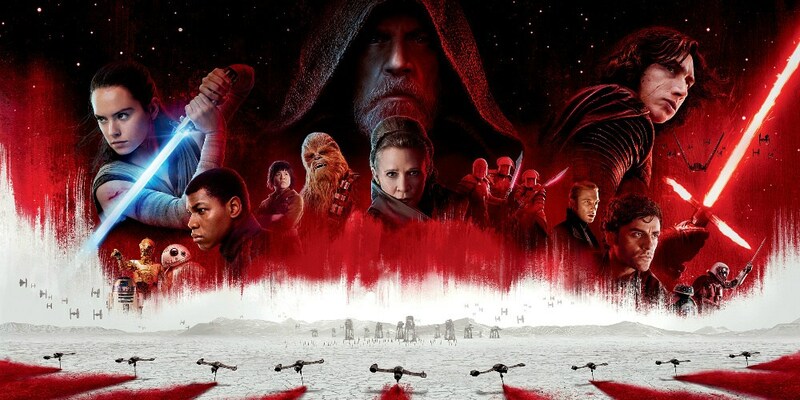 The film ends with the confirmation that the Resistance is more than the surviving band of freedom fighters, but the idea that you can fight the First Order. Like I said, there is a lot going on in this movie, for what is essentially a two-story arc of the Resistance’s flight from the First Order, and Rey’s search for training. That isn’t meant to do the film a disservice, as I thought it was actually really very good. There was so much happening, though, I feel that I need to go watch it again to really take it all in. Much like my initial thoughts on The Force Awakens, I didn’t really feel like this movie fits with the others, either. Though I’m sure that will change in time! It feels like a really good film, don’t get me wrong, and I really did like it, but it definitely felt like a world apart from the others. In common with the last movie, it also has a lot of throwbacks to the original movie trilogy, this time to Empire. The Resistance base on Crait felt exactly like Hoth, and there were at least a couple of shots that directly reference similar shots to the Battle of Hoth. It seemed quite silly that a random soldier dude has to make reference to the fact that the white stuff is salt, not snow, as if just to differentiate. Later on, there is a sequence where Chewie flies the Falcon through the salt mine, which is almost entirely lifted from the Death Star attack during the Battle of Endor – right down to the same music playing. The Canto Bight casino feels like the Cloud City shots we never got to see, etc etc. It’s not as obvious as episode VII, don’t get me wrong, but it still feels a little like this sequel trilogy is being propped up by the original three, and I would prefer to see more entirely new stuff, if I’m honest. Now, let’s address the elephant in the room here. Leia survives the film, while Luke becomes one with the Force. I was really perplexed by this, and I don’t really know where we’re going from here. 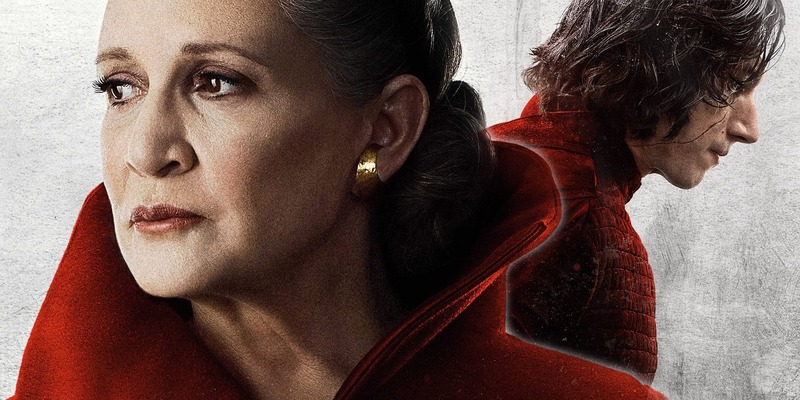 Of course, we knew earlier in the year that Leia had a larger part to play in IX, but with Carrie Fisher’s death almost a year ago now, and Kathleen Kennedy stating that she will not be brought back for episode nine, I can’t really see how they’re going to get round this. Leia is too pivotal a character to be killed off-screen, but the only thing I can think of here is that the opening crawl for the next movie will start with something like “General Leia is dead.” I suppose it’s too early to be speculating with what could happen, but I was fully expecting them to give her a similar death to Oliver Reed’s Gladiator demise. On a related note, though, I was quite pleased to see Luke dying to save his friends, but not being killed in battle. I mean, Luke is my favourite character, so I’m biased here, but I’d always thought he wouldn’t just go out like a chump, as he’s too powerful with the Force. That he managed to project himself across the galaxy to provide the distraction for Leia and co to flee, then just goes into the Force, it really was the best way for him to go. There’s so much to talk about with this movie, I’m really looking forward to seeing it again and just becoming more familiar with it as part of the ongoing saga. There is definitely a lot going on – it’s possibly the most action-packed of the films so far – so I’m sure I’ll be devoting many more blog posts to it in the months to come!! Previous Previous post: New LotR deluxe expansion announced!